On a recent visit to Travis Wetland we saw many webs of the nursery web spider (Dolomedes minor), which builds a nest to protect its young. The spiders typically build these nursery in low growing shrubs, such as this Coprosma bush. The nest below is probably about to be vacated by the spiderlings. We did get a (somewhat blurry!) video of the seething mass of spiderlings. We didn’t see any of the adult spiders, though apparently the females were probably hiding nearby – they guard the nests at night. The nest below is now empty, though there is a spider on the bottom left, perhaps a juvenile? There is detailed information about the Dolomedes genus in New Zealand here. There are four species here, with Dolomedes minor being the most common. For more photos, including of the adult spiders, see here. We had a short visit recently to one of the waterways that runs through Styx Mill Reserve, in Christchurch. The ~60 ha site has an interesting mix of vegetation types (mainly wetland and riparian areas), and even some locally rare plants. But on this occasion we went to look for arthropods – both in and around the water. Below are a few of our finds. Our thanks to the folks at NatureWatch for help with the identifications. Another immature shield bug, probably a Rhopalimorpha sp. There is a guide to many of the species in the reserve on the Landcare website here and the reserve is part of the Styx Project. There is also a comprehensive booklet about Christchurch Waterways available from Environment Canterbury here. We were looking for tardigrades, but without success on this occasion. 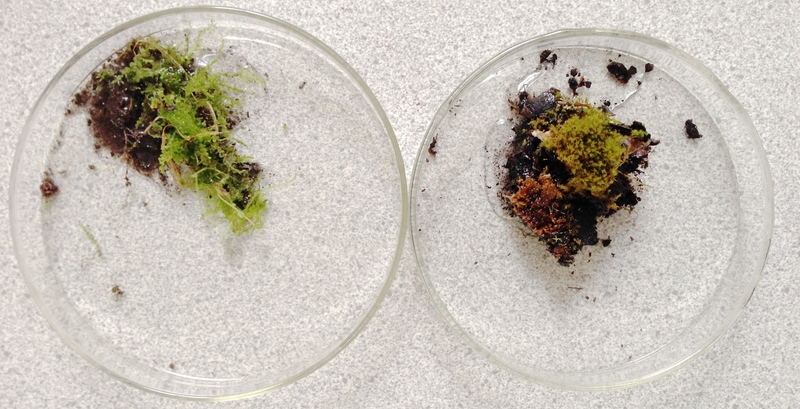 We collected moss and liverwort from our urban backyard, along with some soil, and added water. However, we did find a large number of other small creatures, most of which we were unable to identify. So we posted some of the images on NatureWatchNZ, and several scientists kindly identified them for us. There is also an extensive collection of web pages on New Zealand soil fauna that has been compiled by Massey University here. Their site includes images, information and identification keys. 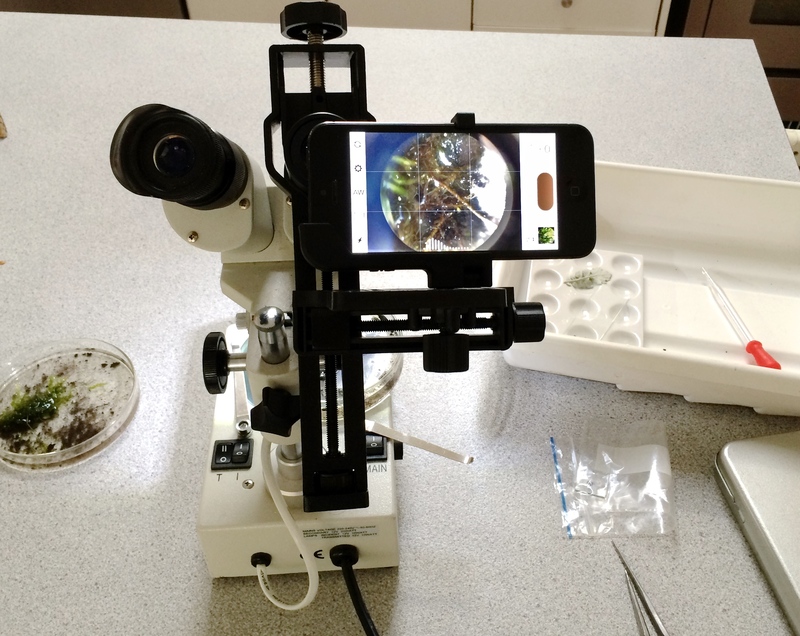 Our photos and videos were taken using a stereo microscope at 40 x magnification, connected to a camera phone, as shown below. The most common creatures we found were nematodes, which are shown in the video below. They are almost transparent and so would be quite difficult to spot, except that they draw attention to themselves by frequently knocking into soil particles. 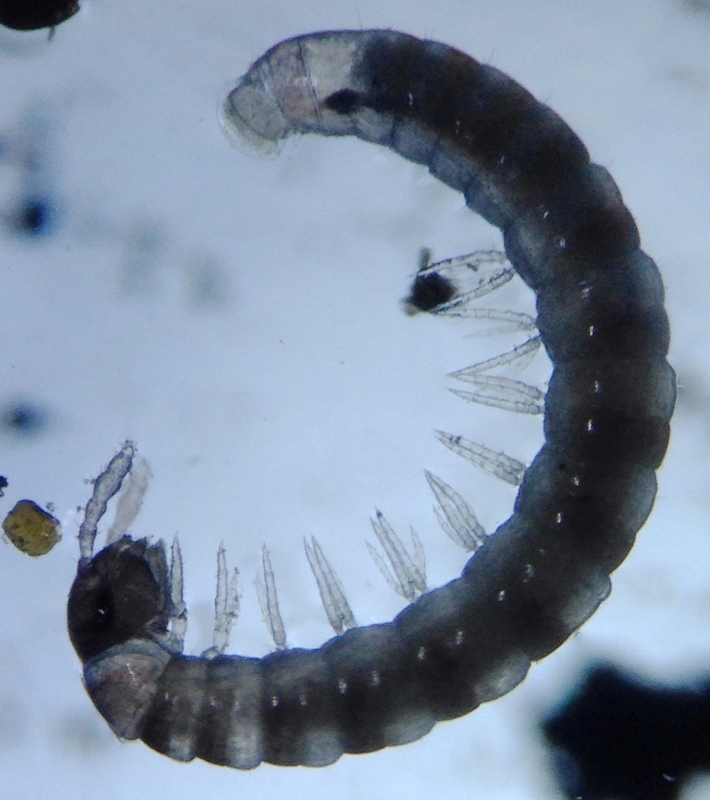 Nematodes are also one of the things that tardigrades like to eat (as well as moss). 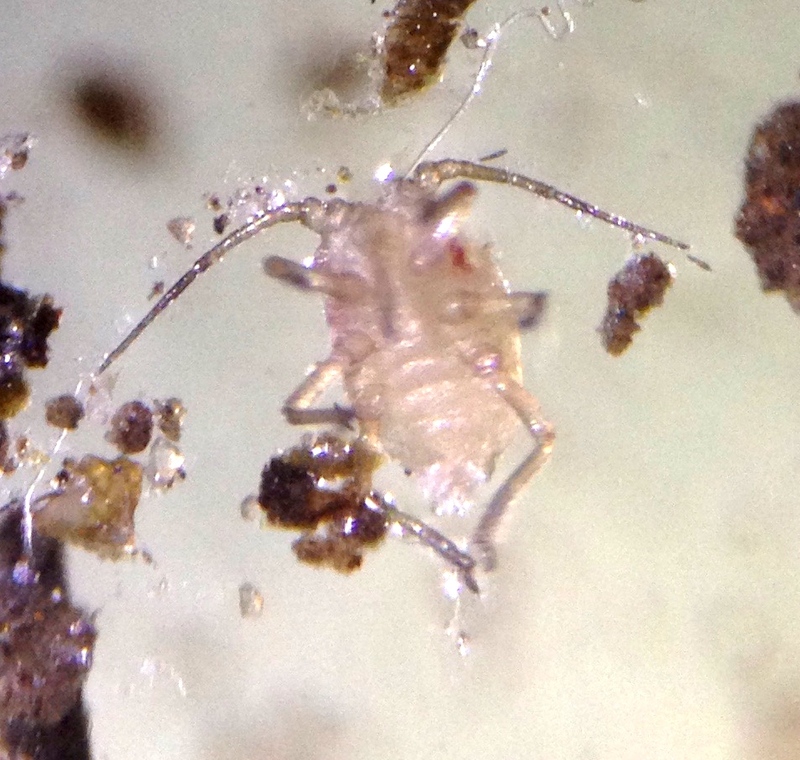 The other animal we found a lot of are these 6-legged creatures with antennae which turned out to be springtails. 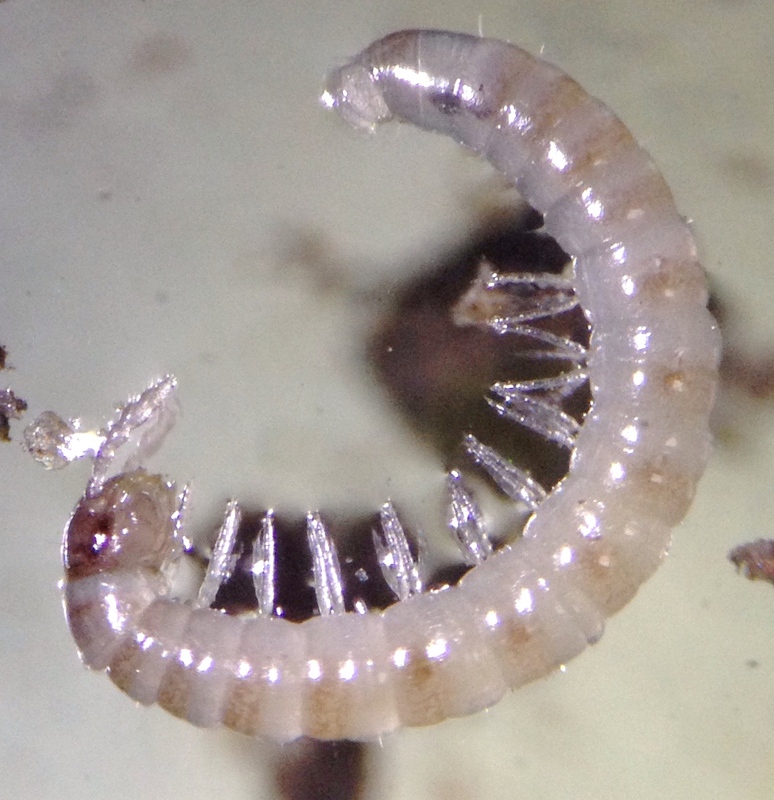 This one is a millipede, with two pairs of legs per segment. There were also lots of very small blobs, whizzing around, that might possibly have been paramecium? It is really impossible to see at this scale. It would be nice to have a greater magnification available, but even the 40x reveals a much more populated space than it normally appears.